Burke Interior Designs: Why Wallpaper? Thinking about sprucing up a space? Are you tired of just painting and moving around the furniture? Have you noticed all the gorgeous wallpapers everywhere? Think about it: How many times have you been in a great hotel or restaurant and have loved the wallpaper? You too can have that "designer" feel in your home. Gone are the days of the wide borders in dining rooms and children's nurseries, It doesn’t have to be four full walls in a busy print. Why not start with a small project that will give you confidence to try it again. 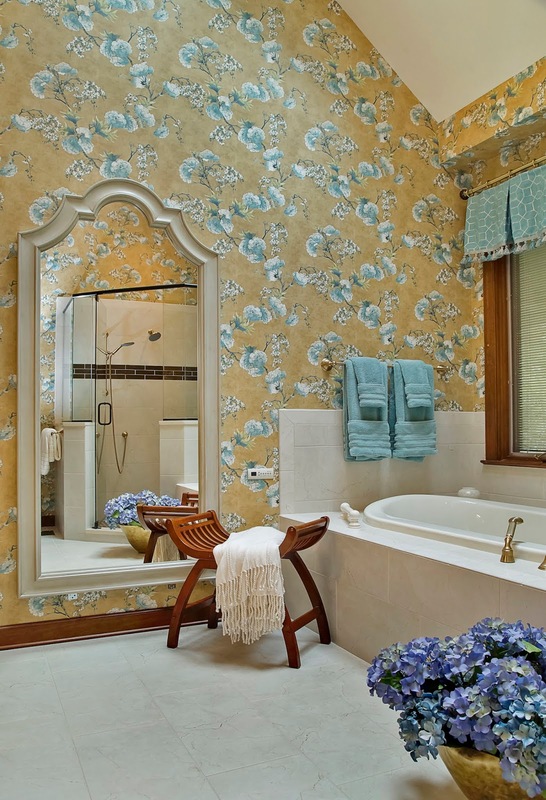 Let's start with some interesting accent walls, foyers and powder rooms. It can just be a highlight or "feature" in a room. For example, a graphic print can have a big impact on a small space. 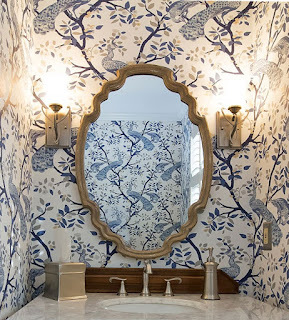 The new rule of wallpaper use is anything goes almost anywhere. As quoted by the owner of Allen Funk Wallpaper Store in Raleigh, “There are few books dedicated to just bathrooms or kitchens any longer.” So, why not add some wall paper to these spaces? There are almost too many possibilities. With the huge array of colors, textures, and patterns out there, pinning up sample squares can help you decide what works best before purchasing several rolls of paper. Wallpaper books may be organized by color and texture or periods, such as Art Deco or Mid Century Modern, etc. Some books are indexed by shapes, like geometric and stripes. Sound overwhelming? It can be, but remember it's not math. There are numerous great choices for a particular project. It’s probably best to start off with wallpaper books organized by color to help you find what you are looking for in that particular "shade of green". If that doesn’t help, try going the route of texture vs. non-texture. The grass cloth from the 70's is a timeless classic. Grass cloth is ultra-forgiving when it comes to nail holes too. When a nail is removed just move the grass cloth fiber over a little bit and it should hide the hole. 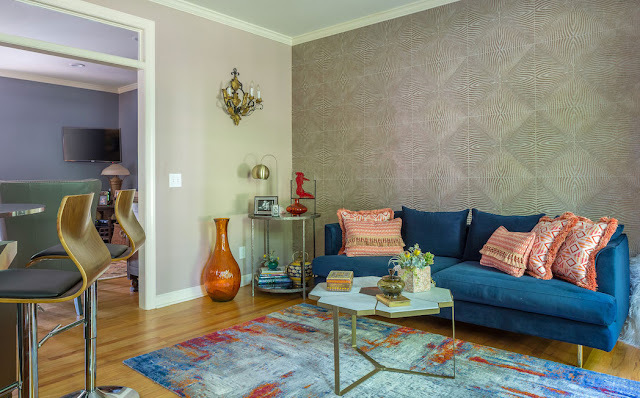 Wallcoverings that have sheen to them with a geometric pattern transform the average living room into a swanky lounge. We have some great local sources for wallcoverings in our area. Allen Funk Wallpaper Store on Duraleigh Road stocks an extensive collection of York Wallcoverings. They have a large inventory of beautiful papers by Thibaut or Schuemacher. If you’re looking for something outside of the realm of York and Thibaut, there is another great local source: Trig Modern located on East Whitaker Mill Road is another source for interesting wallcoverings. They stock a French brand of paper called Elitis, which imitates art on the wall. They also stock samples from the Detroit Wallpaper Company, a full custom wallpaper company. It's not what it was years ago—hard to apply and hard to remove. 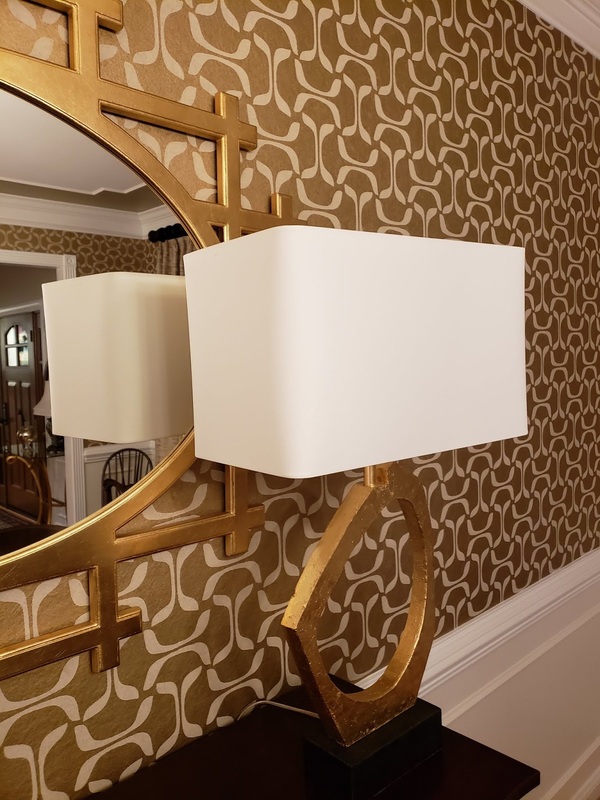 "It's easier to work with and much quicker to apply," says Lori Powers of Wake Forest, an experienced and renowned wallpaper installer. For example, York Wallcoverings sells a product line called Sure Strip. Sure Strip wallcoverings are easier to install and easier to remove then conventional wallcoverings. Manufactured with a unique high-performance backing and special adhesive, they move effortlessly on the wall and remove in full strips when it’s time to redecorate. As quoted by Lori Powers, "It makes our jobs much easier. It's just a lot better to work with than the papers of 80's and 90's." In speaking with the experts, I was informed that what is quite important whether you are a DIY or you a hire pro, is to use a wallpaper primer under all circumstances. It's hard to exactly say what is the cost of a single roll of wallpaper. It could b reasonable as $15.00 a single roll or $400.00 a single roll. It's all priced per single roll and usually sold as double rolls. Confusing right? That's when it’s good to rely on a designer, installer, or local retailer for advice. There are numerous factors that drive the cost. Quality of paper, levels of screens (as in layers of ink), photo-designed, complexity of design, and if the pattern is "raised". All of these features plus where the paper is manufactured, and of course shipped from, contribute to the final cost of the paper. The long answer is, the cost of wallcoverings prices varies greatly. If you have taken the time to select a wallcovering that you love, take the time to hire a qualified professional. Sometimes being a DIY when hanging a complicated pattern might not be as easy as you think. When hiring a professional installer, fees might vary. A good start would be to ask your designer or wallpaper store for a reference. So, say good bye to any monkeys, zebras, or dark green and cranberry-striped wall paper you might have in your home. It’s probably time for a change.